Our American flag is the symbol of freedom. It stands for all that is great and noble about our nation. The American flag recalls victory over tyranny and great deeds of charity, rescue, courage, and devotion. Those who wave it in celebration, or in protest against injustice or encroachment of the God-given rights and liberties this great flag represents, do so with these very feelings and fierce convictions in their hearts and minds. When the flag waves high, the Spirit of America rises in every soul who knows what it is meant to stand for and what has been sacrificed so it may continue to freely wave. Today, unfortunately, we have new leaders with a different attitude — operating with disdain and an intellectual snobbery toward all we cherish and revere. These dangerous power-mongers, led by a Marxist-leaning imposter whose past writings, speeches, and essential documents remain sealed, now figuratively spit on our great flag and all it represents. I was in Phoenix, Arizona, some years ago. I was invited to sing some of my songs for America and freedom at a Minuteman rally. There I found ordinary, everyday people deeply concerned about the ongoing invasion of our nation. They wanted their government to live up to its responsibility to defend our borders. There were some colonial outfits, some American flags, and some signs demanding that our borders be closed. 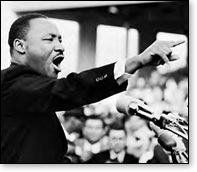 What there was not was any slogan or remark of racism or hatred, or any suggestion of violence. There I was in their midst, known as Neil Goldberg, an obvious Jewish name, and I was treated with utmost respect. A room was provided, and these honestly good folks could not do enough to make me feel welcome and comfortable. 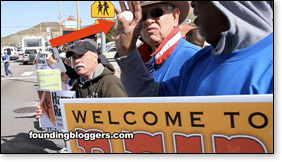 Since then, I have been in the company of many Tea Party protesters at various events. Again, as evidenced by the reality of who and what they are — shown in so many videos — these folks are the best of America. The Tea Party protesters are down-to-earth family people who have worked and served this nation with devotion and integrity all of their lives. They are the ones who have fought the wars, raised our children, obeyed the law, and kept a watchful eye on the levels of morality and integrity within our government. They are also, in many cases, the very people who've made angry calls and wrote letters of protest when real racism was rampant. They cared about America living up to its promise and creed of "liberty and justice for all." Back to the question and the title of this article. How are these present leaders spitting on the flag? When members of a congressional caucus recently walked through the ranks of Tea Party protesters in Washington D.C., some were holding cameras high and filming in every direction. Why? Because they expected to be taunted, insulted, perhaps even assaulted by those they obviously believed were so inclined. This shows the depth of disconnection and fear with which these congressmen are afflicted. They had no idea that, had they stopped to speak with those angry protesters, they could have had a civil, if very blunt, discussion. Had they even just inquired "What's for lunch? I haven't eaten," those Tea Party folks would surely have responded with, "We have some peanut butter and jelly sandwiches, or do you want some potato salad?" No doubt, these ordinary American folks would have been pulling out their food and insisting that these leaders sit down and eat, while they continued the heated discussion, but that was not what was in the plan. The obvious plan was to document on film and audio the presumed meanness, racism, and violent threats of these flag-waving Tea Party bigots. Well, because these leaders are used to believing what they are fed, or what they fear, they do not understand the real nature of the everyday, decent, good-hearted Americans called Tea Party People. These fault-seekers came up with not one bit of recorded evidence of the hatred and racism lurking only in their own fearful hearts. So, plan B. These desperate "operators" reported that they had been spat upon, and that the "N" word had been yelled at them. The facts, however, reveal that they were not too bright. 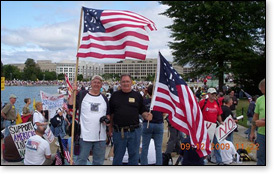 They hastily made the charge that these flag-waving Tea Party protestors had done and said the most awful things to them — but they forgot that they had been seen holding several recording devices high, pointing in various directions. Alas, they had not one bit of evidence of the racism and hatred that remains theirs alone. Had they recorded even one remark, it would have been embellished and broadcast 50,000 times across the world, but no, only their false allegations remain. It's reminiscent of the strategies used by Hitler, Stalin, and other despots who operated on the premise that if you tell a lie loudly enough and long enough, it becomes the truth. Next, we have the incident at Searchlight. NV, where Harry Reid supporters were recorded on video throwing eggs at the Tea Party buses arriving for a peaceful protest. Again, a high level of ability at lying and manipulation, but not too bright. Those throwing the eggs thought they were on the old school yard, where they could slam someone on the head and then tell the teacher that the nice kid they slammed hit them first and had called them names, with many witnesses (their friends) to back them up. What can the teacher, who did not see it, do? Oh, yes, they know these slimy tricks well . . . but they were not too bright. They didn't take into account the video cameras, which recorded the truth, as well as the lies. Those who reported the innocents as the egg throwers to the police were seen on film, eggs in hand — hatred and mischief in heart. Again, the question: How do they spit on the flag? 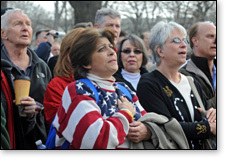 As we watch videos of the Tea Party Folks at their demonstrations, one thing cannot be denied — there are many American flags held high with pride and devotion. These folks' statement is "We stand with this flag and all that it represents, which is freedom, liberty, government of, by, and for the people, and our blessed Constitution — given from God to this free nation. The Constitution is the greatest political document in history, the very foundation of representative government, and we protest any attempt to pervert and undermine it or the flag which proudly represents its purpose and meaning."
. . . but those with no respect nor devotion for these ideals now use the inspiring videos of these free and devoted people and their flag to advance yet another shameless strategy — to equate the blessed and wonderful flag of freedom with hatred, racism, and tyranny. "Look at these Tea Party bigots. They are waving flags. Therefore, they must be violent racists. They must want to lynch and terrorize other Americans." And that, my friends, is spitting on the flag. When they try to paint innocent, decent Americans — the best of Americans — as hateful and ignorant bigots, and using the presence of the American flag as proof, that is spitting on the flag. When they inject a vicious evil lie, proven to be purposely false, into the hearts of their own followers — who they know will believe and act on it at any opportunity to strike back — that is spitting on the flag of freedom and all it represents. When our so-called "free press" turns a blind eye to all such un-American actions and dangerous deceit, shunning their responsibility to present the truth as a free press to a free people, that is spitting on the flag. When those entrusted with defending our Constitution and representing us under that law of the land, to which they have pledged loyalty and obedience, trample that precious document underfoot, using any means possible to advance their agenda — an agenda aimed at subverting, perverting, and eventually eliminating its meaning and purpose — that is spitting on the flag. To call good Americans un-American, to declare that which is false as true, to illegally steal the power of the people, to begin a regime of heavy-handed retribution with the intent of making the American people afraid to stand up and speak out for their rights and their wishes, that is spitting on the flag. To enter into treaties with foreign governments whose peoples live under subjugation in fear — treaties which portend the end of our sovereignty and thus our freedom — that is spitting on the flag. Asserting that United Nations protocols will supersede our own Constitution, leaving us as a people at the mercy and the whims of the tyrants now controlling this UN, that is spitting on the flag of freedom. As with the continual removal of our heritage of freedom — taking away George Washington's and Abraham Lincoln's birthdays, equating devotion to God with racism and hatred, attacking and painting Christians as such when their Bible tells them to love — while at the same time ignoring a religion whose holy book tells its followers to torture, terrorize, and kill any who will not "embrace" their political movement cloaked in religion. Is such irrational behavior a mass death-wish fed by false guilt and self-loathing based on the past evil of slavery, heightened by present feelings of conviction stemming from low habits and lost morality? I think yes . . . but we must realize that, as a people, Americans fought a bloody Civil War to end the curse of slavery (which curse, in my opinion, was why the Liberty Bell cracked at the time of the Revolution, when we tolerated slavery). Now, some intellectuals present the very astute, very informed proposition that the Civil War was not about slavery, but was really a business matter, and slavery was just a ploy to get the public behind the war. Again, very "educated," very "astute," but not too bright. So here we have the truth about the goodness and devotion to freedom of the American people proved by the very arguments of these educated dummies. For, as they themselves have stated, the American people would not have fought such a costly and terribly bloody war over any business matter, but they would, did, and still would fight for the ideals of freedom and equality for all. The general public and the rank and file of the military fought a terrible war because, true or not, they believed it was to end slavery.
. . . but, oh, the cynics come again. 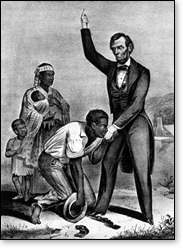 With slavery ended, still we had terrible prejudice, lynchings, and mistreatment of some Americans, they point out. True, but again, millions of white people wrote letters, made calls, marched with and for their black countrymen. We voted, and some died, to absolutely end these un-American conditions. "Yes, but Martin Luther King had to give his life. He was murdered by hatred." Yes, and a nation of white people mourned his death, and a nation of white Christian and Jewish people agreed to a holiday to honor his courage and his gift of real freedom to the American promises of such freedom. Now we have the first president of color, elected by the good-hearted people of America who naively believed in him. They decided to give him a chance, so they elected him. Now we see the most blatant attempts ever to ignore and undermine the Constitution, which this usurper pledged to defend. Now we see the most blatant and sinister agenda yet to use past mistreatment of a noble people — our good black Americans — to create violence and terror against those fighting for the rights and liberties of us all. This is "spitting on the flag." Not enough that a man of color was elected president by predominantly-white America. Not enough that he was entrusted and welcomed to lead us. Not enough that we have the first black attorney general. No, racism is brought up and inflamed at every opportunity. The good American people are accused and berated as "racists" no matter how much they give. Why? 'Cause it works. The innate goodness, the creed of generosity, and fair play of the American people are now used against them by the man they gave a historic chance, and by those around him who show no gratitude or love for the nation with a heart so generous. "Look, they are waving flags. Look, they want the Constitution to be honored. Look, they have Bibles, and they are mostly white people. They have to be racists. They must be violent." We are a fair-minded, generous, eager-to-share people. The first in the world to help, and the last to deny. We honor the mighty God who founded our nation, and we will continue to honor His Son, Jesus, who tells us to love God and to love each other. We will continue to give and to help and to love . . . and we will continue to stand up for our Constitution and for each and every right and freedom it guarantees. And we shall continue to proudly wave our flag, with devotion and dedication for all that it represents, so long as We The People have breath. At the same time, we cannot easily forget the actions of those who dare to spit on the blessed flag of freedom. For grassroots Americans, November 2 cannot come soon enough. Neil Brian Goldberg is an accomplished musician, songwriter, arranger, producer, radio host, writer, and activist originally from Philadelphia. In 1970, Neil wrote 32 songs for the TV show "Archie's Funhouse." These songs, such as Mr. Factory and One Big Family, are still enjoyed today. At the time, they were instrumental in shaping "message" songs for kids' TV, and influenced such shows as "Fat Albert and the Cosby Kids" and "The Bugaloos." Neil has also written songs for such notables as The Monkees, Tom Jones, Dusty Springfield, Richie Havens, and many others. Later in his life, Neil owned a successful computer store in Santa Cruz, California. In the 1990's, he became the host on KSCO radio for a show called "In the Spirit," which had a large following. He has also been politically active in conservative causes — especially pro-life causes, for which he wrote the song called "Almost Born," about partial-birth abortion. 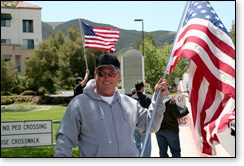 He is a devout follower of Jesus Christ, and a true patriot who loves America. 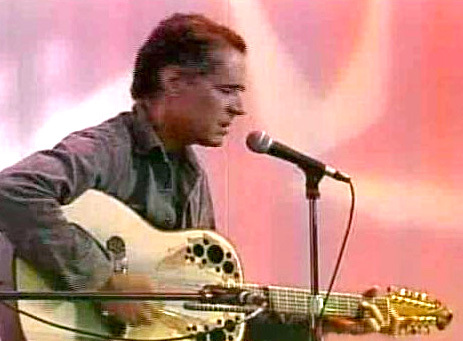 He has written several songs that express his love for this country — "Remember America," "Born in America," "Freedom Bird Fly" — which can be heard and downloaded at his website www.RememberAmerica.net. At his website, you can also watch YouTube videos of his songs, along with videos of his Archies songs viewed at http://www.rememberamerica.net/archies.htm. In 2010, Neil was a candidate for the U.S. Senate from California seeking Barbara Boxer's seat.